PDF OCR X is a software package for the Mac OS X and Windows platforms, designed to convert PDFs, including scanned PDF files into searchable and editable text files via an OCR process. It offers an easy to use workflow process with a simple drag and drop mechanism to initiate conversion. It can export the converted text in either a searchable PDF file or as a plain text file, whichever you prefer. But for those who are looking for more than just OCR functions, you can read on to check the best PDF OCR X alternative. PDFelement ProPDFelement Pro is the best alternative to PDF OCR X. This professional OCR software allows you to edit and convert scanned PDF with ease. You can use the software to create rich text file, fully searchable PDF, and plain text files from your scanned OCR files. Apart from this, you can easily edit the texts, images and pages in PDF and convert PDF documents to other popular file formats as your needs. Advanced OCR feature allows you to edit and convert scanned PDF files easily. Convert PDF to Word, Excel, PPT, EPUB and more formats with ease. Multiple PDF editing tools allow you to edit PDF texts, links in a simple step. Is this really the best solution available for OCR on the Mac platform? When comparing PDF OCR X to the other leading OCR product available for OS X users, iSkysoft PDF Converter Pro for Mac, there are a number of areas where the iSkysoft package is clearly superior. 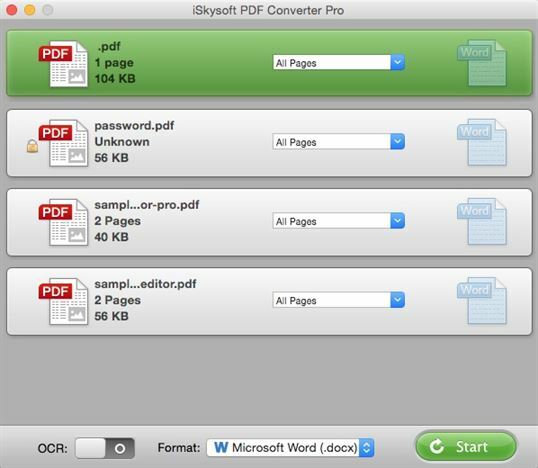 Although there is an obvious price differential between iSkysoft PDF Converter Pro for Mac and PDF OCR X, the extra functionality and performance really do justify the price. PDF Converter Pro for Mac has other handy PDF-related functions - This program has more than just OCR functions up its sleeves. First and foremost, this is a PDF converter that can transform your PDF files into different file formats ranging from images to internet-ready HTML files. Its interface is simpler- While the OCR X is renowned for its incredibly simple interface, the iSkysoft provides an even simpler one. Not only does it allow for quick file conversions, but there are also individual options that make converting a much-quicker process. It preserves the overall layout of the PDF file - The PDF OCR X is capable of extracting chunks of data such as images and text, but iSkysoft actually retains all the original parts of the file, including extras such as tables, graphics, and even hyperlinks and layouts. It supports 17 lanuages, which helps you convert scanned PDF with high accuration. iSkysoft PDF Converter Pro has an attractive and easy to understand user interface that makes processing files a quick and simple job for anyone. With the ability to perform OCR in a total of seventeen languages, it is an incredibly useful tool for anyone no matter where they are. Multiple file output format choices make for a very versatile workflow whatever the end use for the text is intended to be, ensuring that an appropriate format can always be found whatever the project. 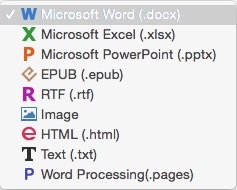 For anyone that needs to OCR multiple documents at once, or perhaps old and poor scans that are easier to work on as individual pages, the batch processing feature, that allows up to 200 files to be queued up to be processed in turn automatically without any further user input can be an incredible time saver. In addition, PDF Converter Pro for Mac also comes with the benefit of being a fully-fledged PDF conversion tool in its own right as well. The other benefit of PDF Converter Pro is that it is incredibly easy to use and can be accomplished in just a few clear to understand steps. 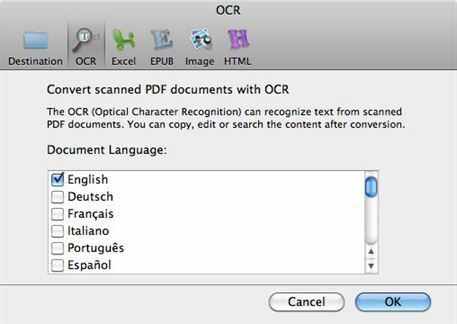 Import the file, or files for batch conversion, to be OCR'd into PDF Converter Pro for Mac. To do this, you can directly drag and drop all the files to the program. Alternatively, you can click the File menu from the gray header bar and select Add PDF File from the drop-down menu. Tips: To choose a language you prefer for the PDF files, you can click PDF Converter Pro on the gray header bar and select Preferences from the drop-down menu. When the Preferences window is activated, hit the OCR tab and make your choice. Using the Settings button to the side of each file choose the appropriate output format and the pages you want to OCR. Tick the Convert Scanned PDF Documents with OCR option and then just click Convert and the process will begin. It really is very easy to use and gives great results too, with the convenience of having the resulting file in exactly the right format, all automatically for you.